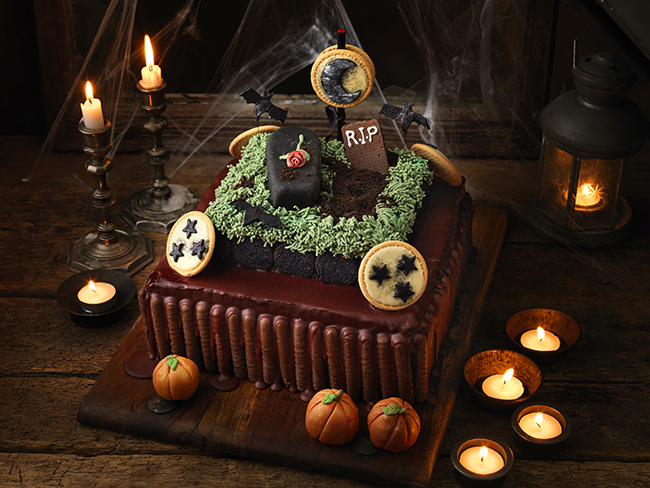 This spooky centrepiece is sure to surprise and delight your guests! 1300 g Schär Universal Mix It! Place the butter and caster sugar into a large mixing bowl and beat well for 1-2 minutes using an electric mixer until it becomes light and pale. Add the remaining ingredients and whisk for a further 2 minutes. Divide the mixture between the greased and lined baking tins. Bake in a pre-heated oven at 170°C/150°C fan/Gas mark 3 for 30 minutes, or until the cakes spring back when lightly touched. Leave the sponge in the tins for 10 minutes before turning out onto cooling racks to be left to cool completely. Place the butter and half of the icing sugar into a mixing bowl and beat with an electric mixer until smooth. Add the remaining icing sugar, milk and vanilla extract and whisk for a further 2 minutes until smooth. When cakes have cooled, sandwich together the 2 x 11” cakes with the butter cream and strawberry jam. 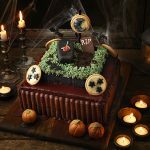 From the 8” cake, carve out a coffin shape to roughly a 4 x 1 ½“and place next to the hole you have just made. Place the 8” cake on top of the larger cake. Crumb coat all of the cakes using a palette knife. Rich Tea chocolate stars and moon - Melt the 50g white chocolate and spoon into circles onto 6 rich tea biscuits, once finished, put in the fridge to set. Cut out 12 small stars from the black icing and decorate on 4 of the biscuits, use a little icing sugar mixed with water to make them stick. Sprinkle with back glitter. Decorate the remaining 2 biscuits with a cut out moon shape and sprinkle with glitter. Chop the chocolate, add it to a heat proof bowl, set aside. Pour the cream into a microwavable bowl and heat for 45 seconds – 1 minute depending on your microwave. Keep a close eye on it so it doesn’t bubble over. Pour the warm cream over the chocolate and let it sit for 2-3 minutes. Start whisking slowly in the middle of the bowl and continue whisking in one direction until the mixture is smooth and well combined. Allow to cool for 10-15 minutes then fill a plastic squeezy bottle with the glaze and drizzle the chocolate onto the top edge and down the sides. Before the glaze dries completely, arrange the chocolate fingers around the sides of the larger 11” cake. Once arranged, add more glaze so that the chocolate floods onto the base. Separate the Chocolate Os into two and scrape out the cream filling, apply a dusting of the edible black glitter and decorate the sides of the 8” cake. Decorate the top of the cake with the ready to roll green icing. Top Tip! To achieve the ‘grass’ look and feel, use a garlic crusher. Roll out the orange icing and cut into segment shapes for the pumpkins. Carefully fold over the Tempties adding green icing for the ‘leaves’. Using the chocolate shorts and white icing pens, create ‘gravestones’. For the coffin, roll out black icing and carefully fold over the piece of sponge you saved earlier. Decorate the cake with the remaining biscuits and icing.